This weeks book companion is for a book that has a special place in my heart. My youngest son has never been that into books (big frown face). I have always read to him since he was a baby, just like my older son, but, he just was never that into books. This book is the one that I can really remember changing that. This is the first book in which he sat for the whole thing! He loved this book, and I did too! This book is a sweet story about a friendly little blue truck who helps a big, rude construction truck when it gets stuck in the mud. The book shows that when you are friendly and helpful to people, they will be friendly and helpful back. This is a rhyming book that flows really well, so it is great for targeting phonemic awareness skills too. 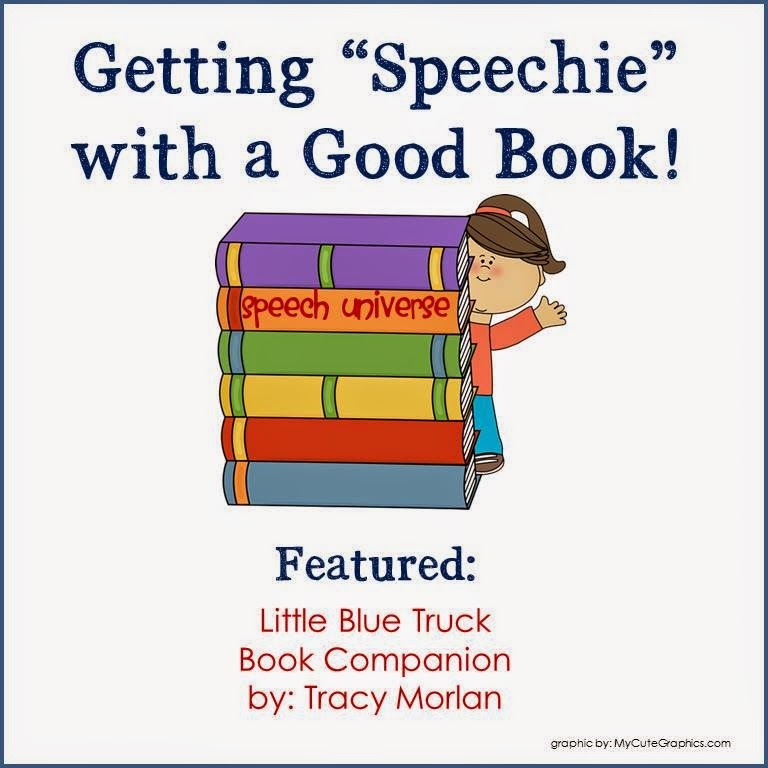 The book companion that I am featuring for this book is by Tracy Morlan of Gold Country SLP. First of all, Tracy includes CCSS Citations and IEP Goals with each of the activities, which I think is a great addition to a book companion! There are two levels of sequencing cards. One has pictures only, and one has text only. There are also six number cards for sequencing. You could use these as a visual template for the picture or word cards. as well as Wh-Question cards. This is a cute barrier game that includes instructions and suggestions, props, and a mat. The first is a Category Sorting Activity for farm vs. zoo animals. The next one is sorting trucks by color. These were great with my kindergarten intervention group! This activity has students match a picture of an animal to the sound it makes. You can use the prop pictures from the barrier game for this activity too. There is a generic board game with really cute game pieces included. You just cut and fold and have game pieces! How clever! This was a great addition to my book companion collection, and I am so grateful to Tracy for letting me share it with you today! You can get this book companion HERE! You can find Tracy on Facebook and at her blog, Gold Country SLP.